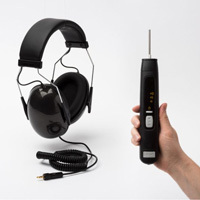 Ultrasonic Leak Detector designed for locating leakages in compressed-air systems, valves, fittings, steam pipelines etc. Quickly and easily detect air and water leaks in building envelopes and rigid air barrier systems. Ideal for testing penetrations (fasteners, masonry ties, etc.) and continuity of joints and seams in rigid air barrier systems.